Review | "Chicken with Plums"
As someone who has great respect for Vincent Paronnaud and Marjane Satrapi's animated wonder, Persepolis, the prospect of not just a new film from the pair, but a new live-action film, was certainly something to look forward to. Persepolis was a deeply personal look at Satrapi's Iranian childhood, based on her own graphic novel of the same name. Nominated for the Academy Award for Best Animated Feature (it lost to Pixar's Ratatouille), the film was a strong contender in a very strong year for film. Sadly, their latest film, Chicken with Plums, falls short of the promise of its predecessor. Also based on a graphic novel by Satrapi, Chicken with Plums tells the story of Nasser Ali Khan (Mathieu Amalric), a world famous Iranian violinist living in France whose life falls apart after the destruction of his favorite violin. Left to Right: Golshifteh Farahani as Irâne and Mathieu Amalric as Nasser Ali. Photo by ©Patricia Khan. Courtesy of Sony Pictures Classics. After trying violin after violin, to no avail, Nasser realizes that life no longer holds any passion or luster for him, and decides that it is time to die. Sequestering himself in his room, Nasser goes on a trip down memory lane, recalling the events of his life that lead him to this moment. As the film unfolds, we discover the love story that informed not only his love of music, but the secret of the violin whose destruction robbed him of the will to live. It's a tragic story told with a sense of whimsy that elevates it above its inherent sadness. The problem is that it is hard to identify with a character who so willingly abandons his family over a broken violin. Granted, all is revealed by the end of the film, but by that time it's too little too late. In those last 15 minutes or so, Chicken with Plums finally hits its stride, discovering an emotional resonance that eludes it for most of its running time. Had the rest of the film been more like its heartbreaking denouement, and sustained that kind of emotional power, it would have been a much more successful film than it is. Instead it plays out like Amelie-lite. While the film borrows heavily from Persepolis' distinctive use of light and shadow, it also borrows quite a bit from Jean-Pierre Jeunet. It's undeniably beautiful (mixing live action with animation in an occasionally breathtaking way), but it also feels awfully familiar, with the lighthearted mix of comedy and melancholy veering closer to Jeunet's territory than Satrapri's singular wit. Their are moments when her voice shines through, but they also rely too heavily on their stylistic inspirations. As a result the film feels disjointed and unbalanced, its flashback structure leaving the audience cold rather than involved. There's certainly a charm about it that reflects from Satrapi's wry sense of humor, but it never adds up to a cohesive whole until its final moments, by which time it is too late to fully enrapture its audience the way Persepolis did. 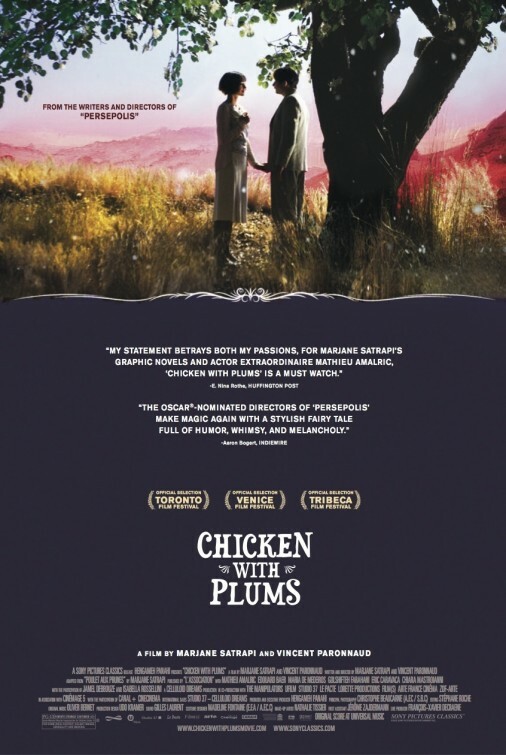 Satrapi remains a unique talent, but Chicken with Plums is not exactly the best showcase of what she does best. CHICKEN WITH PLUMS | Directed by Vincent Paronnaud, Marjane Satrapi | Stars Mathieu Amalric, Edouard Baer, Maria de Medeiros, Golshifteh Farahani, Eric Caravaca, Chiara Mastroianni, Isabella Rossellini | Rated PG-13 for some drug content, violent images, sensuality and smoking | In French w/English subtitles | Now playing in select cities. Opens Friday at the Park Terrace in Charlotte, NC. Blu-ray Review | "Fear and Desire"
Review | "Simon and the Oaks"
Win a Copy of "Dark Shadows" on DVD! DVD Review | "The Best Exotic Marigold Hotel"